Diamond Details: 64 Round cut brown diamonds, of exquisite color weighing 1.45 carats total with 48 round brilliant cut white diamonds, of H-I color, VS2-SI1 clarity, of excellent cut and brilliance, weighing .25 carat total. Metal Details: Charles Krypell 18k yellow gold and sterling silver design. 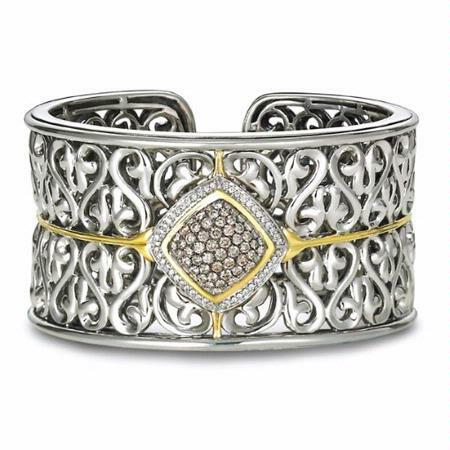 This gorgeous Charles Krypell 18k yellow gold and sterling silver bangle cuff bracelet, features 64 round cut brown diamonds, of exquisite color weighing 1.45 carats total with 48 round brilliant cut white diamonds, of H-I color, VS2-SI1 clarity, of excellent cut and brilliance, weighing .25 carat total. This bangle cuff bracelet is approximately 7 inches in length. We are an authorized Charles Krypell dealer. Please call for pricing 1-800-790-6980 or 1-212-302-2863.